Hanover Engineering was retained by the Borough of Adamstown to assist with the design and permitting of the maintenance building and associated site improvements at the Borough’s Wastewater Treatment Plant located on East Swartzville Road in East Cocalico Township. 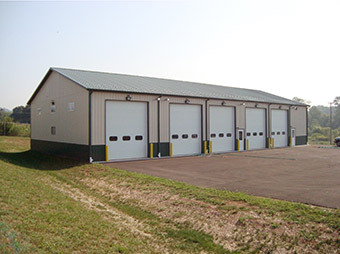 The 4,800 square foot post and frame building included five garage bays, including a separate wash bay, and an office, lunch room, and locker room for Borough Maintenance Staff. The building also contains a storage mezzanine located above the office space. Site improvements included a retention basin and paved parking area. Hanover Engineering prepared the building layout and land development plans, as well as the specifications, and bid documents for the improvements. Hanover Engineering also assisted in the bidding and award of the contract, provided administration and stakeout services, as well as coordinated the review of the building plans from the successful bidder with the Township Code Officer for approval of fire safety and ADA accessibility.